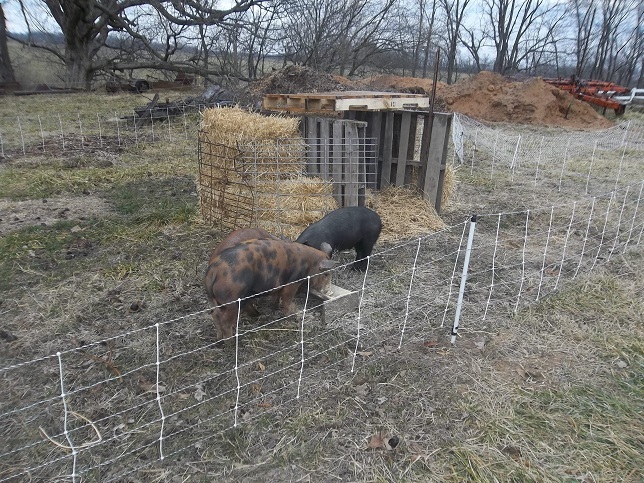 Before we left for Florida I recognized that the pigs were reaching a point where they needed to move out to pasture. They are not cramped in their chicken tractor but it’s time for them to go. Besides, they may just climb out of it. I built a new temporary shelter with pallets surrounded by straw bales, surrounded by hog panels and covered with tarp then filled the living space with waste hay the cows had stepped on and refused. I surrounded this with Premier One Pig QuikFence. Since the pigs were only around 50 pounds I thought I would just carry them to the new pasture. Unfortunately I ran out of time. When I came home from Florida Sunday morning the pigs weighed at least 100 pounds. Well, OK. I’ll just do it anyway. I picked up the first squealing, squirming monster and the other two came to its defense biting me on the leg. You should see the bruise. Now, to get the cows in the barn for the evening I had to take the fence down so I had my son unplug the perimeter momentarily, closed up the pig pen and strung a new wire over to the fence. We finished up chores and checked on the pigs again before heading inside for dinner and an early bedtime. It could not have been easier to move the pigs. Nothing went wrong at all. Everything was perfect. Then dad stopped by on his way back from the barn to tell me the pigs were out. Worse, they were visiting the neighbor’s barn. Ugh. My fence wiring was at fault. 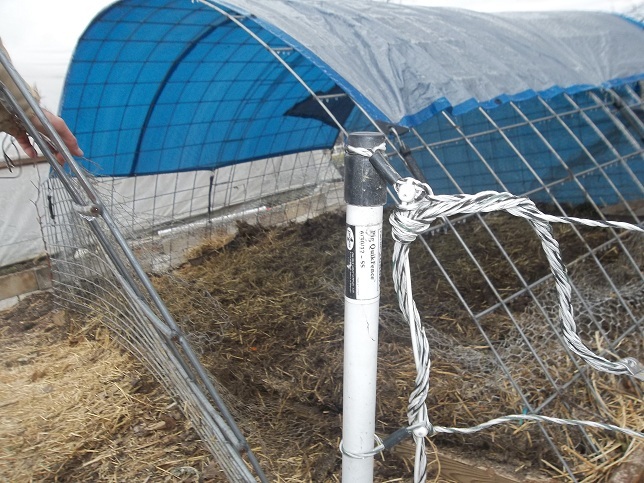 The wind blew and the ice-covered wiring lost the connection to the perimeter fence. The pigs just walked over it and went on an adventure. 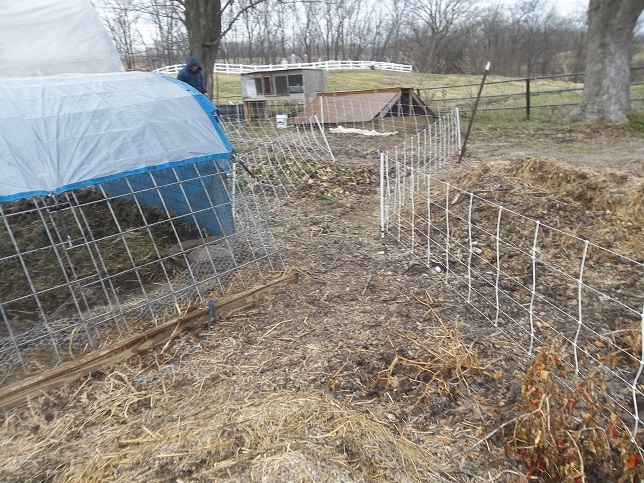 After some amount of coaxing with spoiled milk and old chicken soup, some work and serious praying the pigs are back in their pen in the garden. We’ll try again on Tuesday. 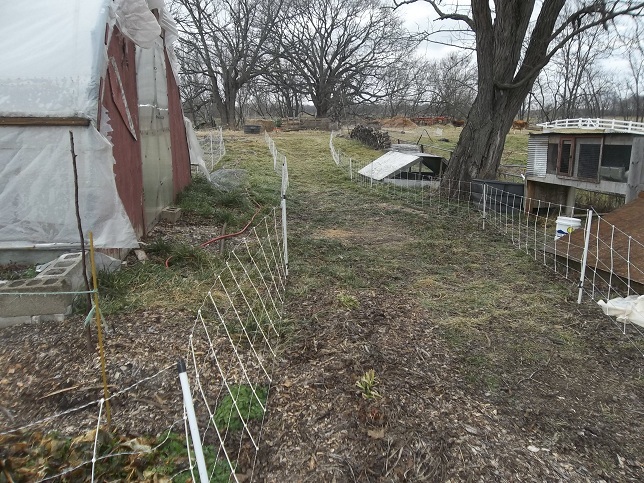 This entry was posted in Pastured Pork and tagged Moving Pigs, Pigs on Pasture. Bookmark the permalink. ← Adding Value the Ferengi way.